Here's an analysis of utility stocks that you won't have seen before, and why a northeastern U.S. utility comes out on top. 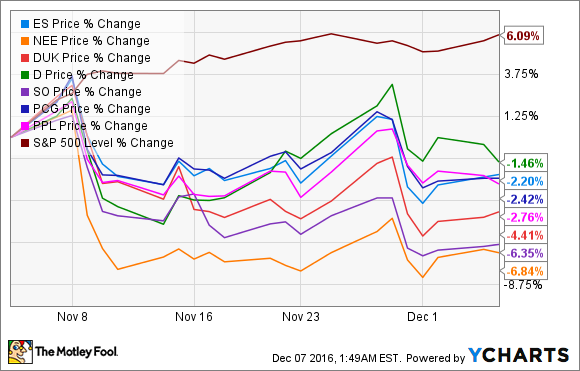 Everyone knows dividend-seeking investors like top utility stocks. But if interest rates keep rising, what would it mean for the relative attractiveness of their dividend yields? With the U.S. presidential election over, Federal Reserve Chair Janet Yellen has been making increasingly hawkish statements on interest rates, so utility investors need to think carefully about 2017. That said, here's an analysis of the best utility stocks to buy. Before we go any further, here are a few cautionary words on interest rates. If you know where interest rates are headed, you can make significantly more money than you ever could on equities. The point of this exercise is to understand the risk in your utility stocks from exposure to rising interest rates, in order to better balance your portfolio. For example, you could buy some stocks that benefit from higher interest rates in order to diversify risk. Electric utilities tend to have favorable dividends. Image source: Getty Images. Utilities produce relatively stable income streams, and dividends which become less attractive as interest rates rise. . They usually carry debt, which can be interest rate sensitive. To flesh out these points, first consider that a jump in the 10 year treasury yield of 2.3% to say 3.5% is an increase of 52% which means a utility will have to increase its dividends paid by 52% just in order to keep pace with the rare increase and the price of the stock will still be the same. Second, with regard to empirical evidence, it's far from decisive so readers are invited to draw their own conclusions. The chart below shows the 10 year treasury yield (x-axis) compared to the dividend yield on the S&P 500. 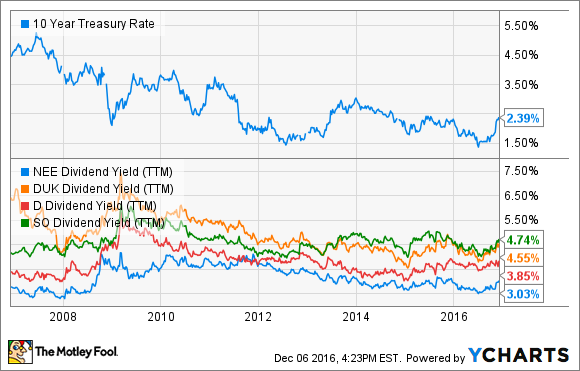 As you can see the data is a pretty good fit and suggests as rates rise the market will demand a higher dividend yield. Data source: S&P 500. Chart and analysis by author. In order to test for these qualities, I've compiled the following table. All stocks were selected because they have a yield above 3%. Data source: company presentations. Chart and analysis by author. Because the implied rate of return on their stocks is too low, the first line of testing rejects PG&E Corporation (NYSE:PCG) and Duke Energy Corporation. Financial leverage is simply a measure of how a company's EPS (earnings per share) changes in relation to its EBIT (earnings before interest and taxes); a high number implies a company has been building up debt in order to generate earnings growth. For these reasons, Dominion Resources and PPL Corporation (NYSE:PPL) don't make the cut. The final test compares debt to shareholder equity; a higher ratio is bad. For this reason, The Southern Company and NextEra Energy get the axe. All of this leaves Eversource Energy (NYSE:ES) as the best all-round pick of the stocks. All told, the New England-focused utility, formed by a 2012 merger between Northeast Utilities and NSTAR, offers a combination of generous dividend, some capital-growth prospects, and manageable debt -- and it hasn't been loading up on debt in order to generate growth. In addition, analysts expect a 6% EPS growth rate for the next couple of years, and Eversource Energy is well placed to deal with rising interest rates.